What can economics contribute to the study of human evolution? The Evolution of Menopause. Why does life continue after reproduction ceases? BioEssays 23:282±287, ß 2001 John Wiley & Sons, Inc. Figure 1. a: The variation of survival and fecundity with age of a Taiwanese human population in 1906. (14) b: A geometrical representation of the fecundity data, and hypothetical fecundity with ages of menopause in the range of 45±65 years. menopause in the case of an extreme 20-fold increase in mortality of orphans, but not for the more realistic 5-fold increase. (11) Increased orphan mortality is insufficient on its own, i.e. without an age-related increase in maternal mortality, to explain menopause even with the draconian assumption of a 20-fold increase (case not shown). Hypothesis tality > daughter's fertility enhancement > reduced grandchild mortality > orphan mortality > reduced daughter's maternal mortality. The primacy of the age-dependance of maternal mortality can be readily appreciated when we note that this factor affects not only the survival of the older females themselves but also their potential for making further contributions to child and grandchild survival and to the fecundity of their adult daughters. Figure 3. Relationship between the intrinsic rate of natural increase and age at menopause for a composite model where maternal mortality increases moderately with age, 10% of fertility is attributable to maternal assistance, juvenile survival is 5-fold higher with a living mother and child mortality is reduced by 10% with grandmaternal care. (Parameter values: mchild  0.012, massist  ÿ 0.01, mdepgrand  0.015, (a,b)birth  (0.000485,0.181), ab  0.12, (a,b)livingmother  (0.226,1.074), (a,b)orphan  (1.107,1.78) and am  ÿ 0.01488.
mother increases juvenile survival. Even in the case that a grandmother reduces mortality by 30%, there is no apparent selection for menopause. x am . The constant am is estimated by least-squares fit to the data. 1. Williams GC. The Tithonus error in modern gerontology. Quart Rev Biol 1999;74:405±415. 2. Gosden RG. Biology of the menopause: the causes and consequences of ovarian aging. London: Academic Press. 1985 3. Pavelka MSM, Fedigan LM. Menopause: a comparative life history perspective. Yearbook Phys Anthropol 1991;34:13±38. 4. Caro TM, Selen DW, Parish A, Frank R, Brown DM, Voland E, Mulder MB. Termination of reproduction in nonhuman and human female primates. Int J Primatol 1995;16:205±220. 5. Wise PM, Krajnak KM, Kashon ML. Menopause: the aging of multiple pacemakers. Science 1996;273:67±70. 6. Williams GC. Pleiotropy, natural selection, and the evolution of senescence. Evolution 1957;11:398±411. 7. Peccei JS. The origin and evolution of menopause: the altriciality-lifespan hypothesis. Ethol Sociobiol 1995;16:425±449. 8. Hawkes K, O'Connell JF, Blurton Jones NG. Hazda women's time allocation, offspring provisioning, and the evolution of long postmenopausal life spans. Curr Anthropol 1997;38:551±577. 9. Hawkes K, O'Connell JF, Jones NGB, Alvarez H, Charnov EL. Grandmothering, menopause, and the evolution of human life histories. Proc Natl Acad Sci USA 1998;95:1336±1339. 10. Hill K, Hurtado AM. The evolution of premature reproductive senescence and menopause in human females: an evolution of the ``grandmother'' hypothesis. Hum Nature 1991;2:313±350. 11. Hill K, Hurtado AM. Ache life history: the ecology and demography of a foraging people. New York: Walter de Gruyter Inc. 1996. 12. Rogers AR. Why menopause? Evol Ecol 1993;7:406±420. 13. Partridge L. Menopause for thought. Nature 1993;364:386. 14. Hamilton WD. The molding of senescence by natural selection. J Theor Biol 1966;12:12±45. 15. 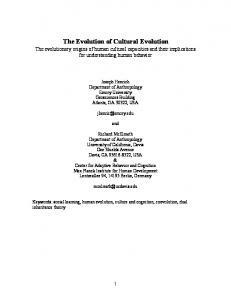 Kaplan H. A theory of fertility and parental investment in traditional and modern human societies. Yearbook Phys Anthropol 1996;39:91± 135. 16. Sear R, Mace R, McGregor IA. Maternal grandmothers improve nutritional status and survival of children in rural Gambia. Proc Roy Soc B 2000;267:1641±1647. 17. Packer C, Tatar M, Collins A. Reproductive cessation in female mammals. Nature 1998;392:807±811. 18. Grimes DA. The morbidity and mortality of pregnancyÐstill risky business. Am J Obst Gynecol 1994;170:1489±1494. 19. Abitbol MM, Chervenah FA, Ledger WJ. Birth and human evolution: anatomical and obstetrical mechanics in primates. Westport: Bergin and Garvey. 1996. 20. O'Connell JF, Hawkes K, Blurton Jones NG. Grandmothering and the evolution of Homo erectus. J Hum Evol 1999;36:461±485. 21. Kirkwood TBL. Human senescence. Bioessays 1996;18:1009±1016. 22. Turke PW. Hypothesis: menopause discourages infanticide and encourages continued investment by agnates. Evol Hum Behav 1997;18: 3±13. 23. Finch CE. Longevity, senescence, and the genome. University of Chicago Press. 1990. Report "Evolution of the human menopause"